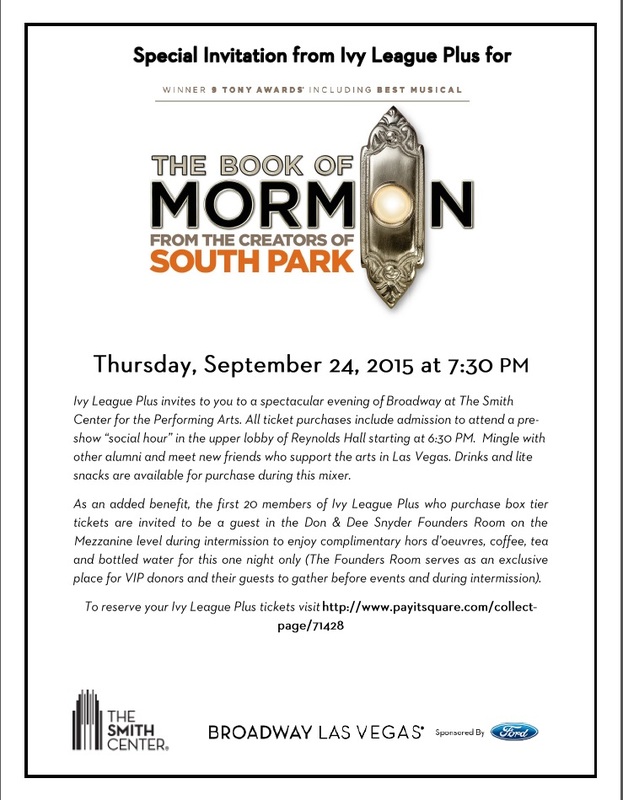 Harvard Club of Nevada alumni, friends, and parents are invited to attend a special pre-show "social hour" prior to, and accompanying, the Smith Center's presentation of The Book of Mormon on Thursday, September 24, 2015. The Social Hour, will be held in Reynolds Hall of the Smith Center starting at 6:30pm. The Book of Mormon will follow at 7:30pm. Please join us for this wonderful event and social. Group tickets must be purchased by July 24, 2015 to ensure seating together. Gallery seats ($59) and Box seats $99 are available. On the website, insert the number of each ticket type into the purchase box to reserve and pay for your tickets. This offer is not available online except through the link above. We are also planning a meal before the event for those interested; information on that part of the event will come later. We look forward to seeing you at The Smith Center!